Radhika Dalal, a student at Kamiak High School in Mukilteo, presented a talk at TEDxSnoIsleLibraries on Nov. 18. 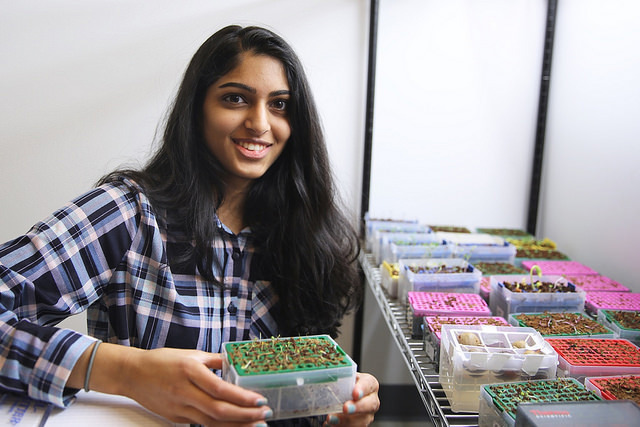 She also participated in a summer internship at ISB to learn how to become a student ambassador for Project Feed 1010, a Baliga Lab research initiative that aims to make scientific breakthroughs for scaling up sustainable agriculture as well as developing and implementing associated STEM curriculum in high schools across the United States. In her TEDxSIL talk, Radhika told the story of how technology and social media have impacted how her generation connects, builds relationships and approaches higher education as a pathway to careers that have social impact. She is also the youth organizer for an upcoming TEDxYouth@KHS event. Want to participate or support the ambassador program? Please contact Jessica Day, PF1010 Project Manager.